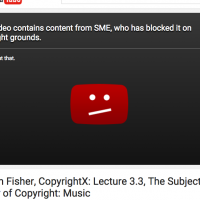 This is not the first time a Harvard law professor has been the subject of a DMCA takedown of an educational fair use. See my August 2013 post, Liberation Music Throws Lessig a Meatball Pitch in “Lisztomania” DMCA Takedown Suit. Update: On February 17, 2016 Youtube restored the video. Next post: Sotomayor, Kagan …. ?